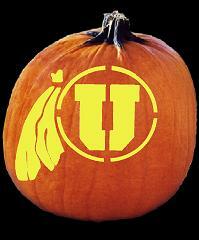 COMMENTARY — In honor of the Utes blackout game on Halloween night, here are a few Halloween related observations about the game. Swoop stayed true to both Halloween and the blackout game with a killer Batman costume. My favorite costumed spectators were a waddle of penguins in the MUSS (yeah, that’s the right term, I even looked it up to make sure). The blackout game did make it easier to find Waldo in the crowd. Chase Hansen played the role of the Sandman and put Oregon State’s QB to sleep with a safety blitz and monster sack in the fourth quarter (and I’m talking about the Sandman made famous by Metallica: “exit light; enter night; take my hand; off to never never land”). I was a little disappointed that more people did not dress up in the press box (fortunately my wife had limited me to a Buzz Lightyear t-shirt, and she made me leave my blow-up wings at home in light of the elbow-to-elbow seating arrangement). As for the game itself, the outcome was never in serious doubt at any point in the contest, and it wasn’t as close as the score or overall statistics might otherwise lead you to believe. Kudos to Coach Gary Anderson, who had the Beavers believing for a brief period of time in the first half that they could actually compete with the Utes. However, more often than not Oregon State simply could not finish drives. Even when they reached the red zone, they came away with more field goals than touchdowns. Eager Beavers perhaps, but ineffective nevertheless. As the game ended Saturday night, what really struck me was the contrast between the two programs I had just watched play. There are some common threads between the two schools. 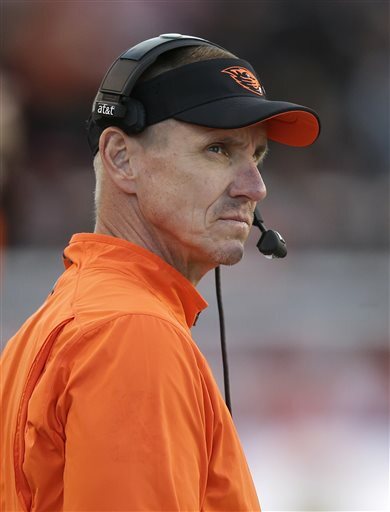 Oregon State’s coaching staff is peppered with former Utes, including head coach Gary Anderson and assistant head coach/defensive coordinator Kalani Sitake. Both men played for and coached at Utah. However, the history and current trajectories of these two programs is as different as night and day. What is currently known is the Pac-12 Conference first germinated 100 years ago on December 2, 1915 at a meeting in the Imperial Hotel in Portland, Ore. Oregon State, along with Oregon, Washington and Cal, were the four charter schools in what was known then as the Pacific Coast Conference. In other words, Oregon State is one of the blue blood original aristocracy of the current Pac-12. In contrast, Utah is one of the newest members of the Pac-12, having joined in 2011. Shortly after the Utes joined the Pac-12 in 2012, the Beavers posted a 9-4 record (6-3 in conference play), while Utah went 5-7 (3-6 in conference play). Going in to this season, the Utes were picked to finish fifth in the South Division, while the Beavers were picked to finish sixth in the North Division. However, Utah has exceeded expectations and is currently in control of the South with a 7-1 record (4-1 in conference play), while Oregon State is 2-6 (0-5 in conference play). Coincidentally, Utah and Oregon State are the subject of the Pac-12 Network’s The Drive. Nowhere is it more apparent that the Beavers and the Utes are two ships passing in the night (and going in opposite directions) than in The Drive’s side-by-side presentation of these two programs. So the lesson to be learned is that regardless of your background and origins, you have to earn your own way and prove yourself week in and week out on the field of play. Of course, this is nothing new in America — the British aristocracy looked down their noses at the colonists until the colonists broke their British noses in a good old-fashioned brawl. Now, I have no ill will towards Oregon State and I am not suggesting that they have ever thought that they were better than Utah because of the Beavers rich history in the Pac-12. I just want to point out that history doesn’t matter when you lace up the cleats and step on the football field, and the Utes have proven they belong in the Pac-12. Utah is going to have to continue to prove itself in a tough road game at Washington this week. The Huskies beat USC in The Coliseum earlier in the season, and just last week trounced Arizona 49-3. The Utes and the Huskies are both very physical and well-coached teams. The first team to blink is likely to lose. Utah coach Kyle Whittingham sums up what the Utes are up against this week very succinctly. For the record, Utah has never beaten Washington — 0-8 all-time. It’s a program that is also rich with tradition. But again, tradition doesn’t win football games. Here’s hoping that Utah takes its A-game to Seattle and returns with another win under its belt.